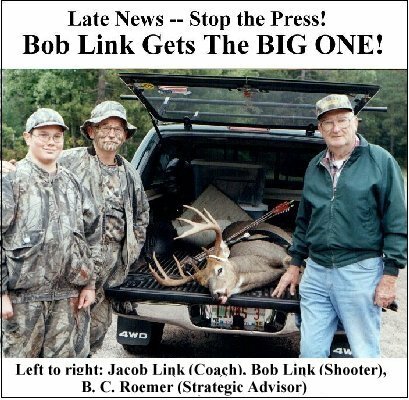 Now a year or so after 9-11 and 24 -7 coverage of it, (yes, we must be aware and alert to all the developments) we all need to clear our minds and hunting can do just that. The smell of fresh fallen leaves, the crunch underfoot of early morning frost, the rays of dawn in your eyes while the earth below is still dark, the hop, hop racket of squirrels in the leaf blanket, jabbering geese up high, turkeys flying down, birdsongs, chickadees on your bow, nature is waking up and there is no better mind clearing sight or sound period. And maybe, just maybe the stars will line up and you'll collect a 10 or 12 pointer. Go for it! A year after that sad day of 9-11-02, the country is still here, people are going about their business, living their lives, raising their families,... What's amazing is what hasn't happened. Americans aren't living in fear. Out of 300 million or so folks in the U.S. there are bound to be some nut cases. Some other "bad stuff" will happen. But the vast majority of these 300 million people are living peaceful, productive lives, getting along in civil and decent terms with each other. Western society seems to have survived Ben Laden's "best shot" a whole lot better than al qaeda has. And if the terrorists wanted to sabotage the U.S. economy, some of our own home grown "crooks in suits" at Enron, Tyco, etc seem to have done a much better job. Fortunately the archery business is made up mostly of small family owned businesses. I think our industry is in better shape than some of those "big ones". And last time I counted the change in the pop machine, we were still short of 100 million to steal, so we'll still concentrate on feathers, not stock shenanigans. It wasn't a great year in archery. The economy, animal rights, chronic wasting disease - all were not good for us. But... given the shock of 9-11, and all the other negatives, it sure could have been a lot worse. The archery market didn't suddenly disappear. It's encouraging that archery survived as well as it did. Eventually the economy will improve, AMO and many other state organizations are working hard on legal problems, and public relations. We are all working on getting more kids in to archery. Much needs to be done, but much is being done. For many years our Trueflight BarredTM pattern has been popular with both modern and traditional archers. However we have noticed that while our black and white pattern (white or grey barred) is an attractive high contrast jet black and blue-white which looks great on carbon shafts - it doesn't quite match real natural barred feathers. Because of this, we have added a new Trueflight BarredTM color which is a much closer match for real natural barred feathers. A new color brochure showing all of the solid and Trueflight BarredTM colors is enclosed with this newsletter. We are pricing the new Traditional Bronze Barred the same as the rest of the Trueflight BarredTM colors. Already it has become one of the most popular Trueflight BarredTM colors. You may have noticed that the Trueflight BarredTM colors shown on our new brochure look brighter and cleaner. This is no accident! We have made a major improvement in our Trueflight BarredTM process which gives us much better colors and higher contrast bars. The Chartreuse Barred are particularly nice looking - just the thing for someone who wants highly visible camo! All of our new Trueflight BarredTM production is being done using the new phase three process. We feel this is a great improvement which will make the Trueflight BarredTM patterns even more popular. Whenever I walk by Bob's shipping room I always have to stop to admire some of our finished die cut feathers just before they are sent out. I'm always amazed at how uniform and consistent they are. You'd think we had one big automatic machine that pops them out by the million. If only we did! 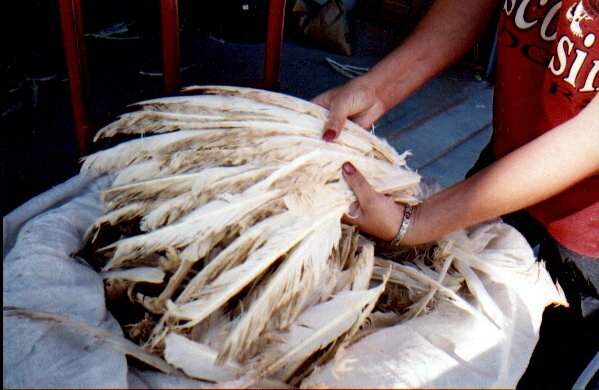 The reason I'm so amazed at the final result is that I see the raw feathers we use. The raw feathers we receive are anything but uniform. We get short feathers, stained feathers, damaged feathers... We are normally able to use less than 50% of the raw feathers we buy. How do they get sorted out? By hand! Every solid color die cut we sell has been individually handled and inspected a minimum of three times. Trueflight BarredTM patterned feathers are individually handled as many as five times. All of this is done by hand by some very skilled and dedicated people. At trade shows we still occasionally have folks look at a box of die cuts and ask, "But don't you sell any real feathers?" I suppose we should take it as a compliment that our feathers look like mass produced items. But most people have no idea of the amount of time and effort it takes to produce that end result. This is the raw material for Trueflight Feathers! On Behalf of all of our employees, our heartfelt thanks to all of you for all of your patronage of Trueflight Feathers. We're all very grateful for all of the work you sent our way, especially when so many things are not so good in our Country and World. The big news in Wisconsin as most of you know is the Chronic Wasting Disease out break. If things are not bad enough, our news media has made them worse with their reporting. Hunters in our state are worried, scared and unsure of what to do. Good news at the Link's cabin! 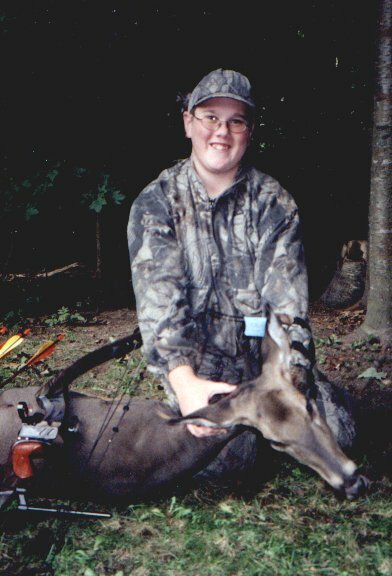 My Son and best Friend, Jacob, harvested his first Whitetail Deer, a doe, with his Bow and Arrow. He made a good shot and was rewarded with a good blood trail which was a blessing as she jumped a creek and headed into a tag alder marsh. When we found her about 75 yards away, needless to say there were two very happy bowhunters in Northern Wisconsin. Finally my best buddy got blood under his fingernails! I'm very proud of Jacob and look forward to him receiving his first gold pin award as a member of Wisconsin Bowhunters. I just want you to know that all of us at Trueflight will continue to work very hard to manufacture the best quality feathers possible. It is our hope that we will once again have the opportunity to serve all your feather needs in the future. I will look forward to seeing many of you at the A.M.O. Archery Trade Show in Indianapolis. Our Booth number is 1350. Please stop by! In response to overwhelming popular demand... Well, at least some demand... We now at long last are offering to the shooters of Trueflight Feathers, official Trueflight Feathers Caps. 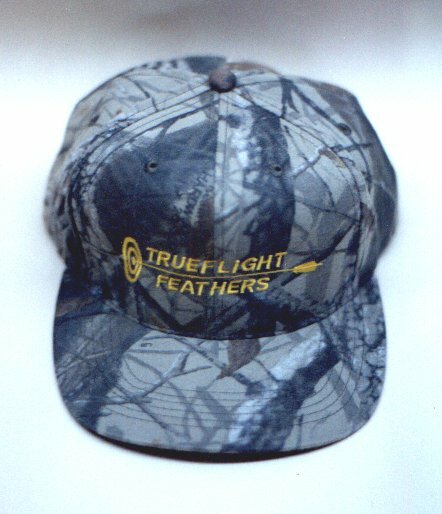 These caps have been personally hand specked by Bob Link , Trueflight's General Manager and Chief Hunter. The caps are high quality 6 panel, embroidered, solid fabric in Real Tree Hardwoods 20-200TM camo, and are made in the U.S.A. The caps are priced at $12.00 each plus $3.00 shipping in the U.S., if we can't send the caps with a feather order. If this was eBay, we'd add that the caps are, "Rare, Collectors Edition, limited in quantity, Investment Grade..." But we're more high class than that. We'll only claim that these caps are the perfect accessory for posing with a Pope & Young buck, and we'll make as many as need so that no "good hunter" goes bare headed! 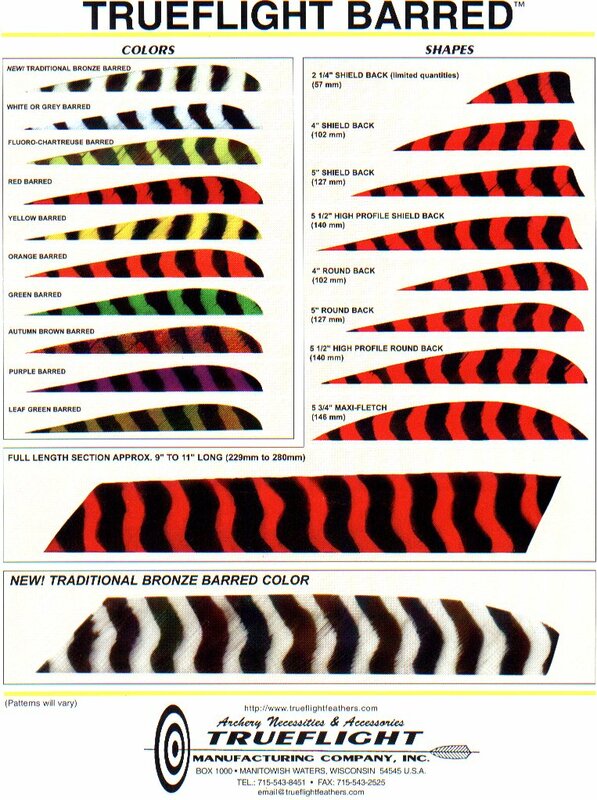 We are still getting questions from consumers about "angled" or "helical" fletching on arrows. This is one case in archery where, "once size does fit all." Specifically, we strongly believe that every arrow should be fletched so that it rotates in flight. A straight clamp, angled slightly, gives some rotation, while helical fletching gives greater rotation. Helical fletching is very useful for controlling wide, heavy broadheads. Why rotate? Basically for two reasons. First because every arrow has microscopic imperfections which will cause it to deviate slightly in flight. If the arrow is not rotating, the error accumulates in one direction and becomes significant. If however, the arrow rotates, the error is "cancelled out" with every turn of the arrow. Second, a rotating arrow develops a gyroscopic momentum which tends to keep the shaft pointed in one direction. This is a significant factor - we are talking about rotation rates in the range of 1200 to 2500 RPM! Drawing 1 shows some test results for a typical feather fletched hunting arrow. The test arrow was fletched with a strongly helical Bitzenburger clamp. Notice that after the "spin up" period, the arrow is rotating at about 2850 RPM, or about 1 turn every 5 feet. 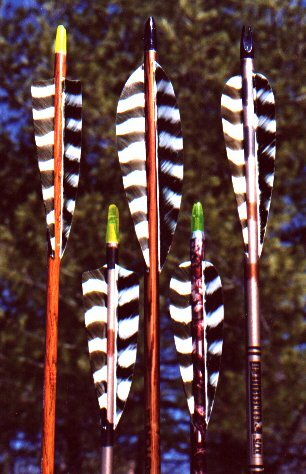 We did notice, by the way, that a plastic fletched arrow has a longer "spin up" time and distance, probably due to the less efficient plastic vane surfaces and the added mass of the heavier plastic "web" away from the arrows axis of rotation. Few things in archery apply in "all cases", but we're convinced that it is very desirable to have rotating arrows regardless of fletching type, arrow type, bow type, shooting style, ... etc. Some years ago I remember reading a list of "Great Themes" in human history. One of the 5 or 6 "Themes" was, "THE ARROW". Well, now I'm wondering if who ever wrote the list was on to something. It seems that the main weapon used by current generation Abrams Tanks against enemy armor is - an arrow! And one heck of an arrow it is. This anti-tank "projectile" is basically a hard, dense metal rod about 1 inch in diameter, and about 18 inches long. It is stabilized in flight by metal fins at it's rear. This metal rod contains no explosive! It penetrates any known armor simply by it's own momentum - it's rumored speed is on the order of 6000 FPS! These metal arrows are fired from the Abrams smooth bore cannon. While in the barrel, they are stabilized by light weight "sabot" pieces which also seal the propellant gasses behind the "arrow". Once the "arrow" leaves the barrel, the sabot pieces fall away. It's amazing to see that the basic principles used by this very modern battle weapon are the very same principles used by an archery arrow. Both employ aerodynamically stabilized inert projectiles, which depend on their own momentum to penetrate a target, and which maximize their penetration by concentrating a relatively large mass in a relatively small frontal cross section (or "ballistic cross section"). It's kind of humbling to realize that even the 5000 year old ice man might recognize the "anti-tank arrow" as an arrow. While he might not be able to imagine how it's shot, he might very well understand how it flies and how it does it's damage.